This weekend I attended Derbyshire’s first Scouts of the World Award (SOWA) discovery weekend. As I write this, I’m getting the feeling this post is going to be very short. I just don’t know how to summarise this weekend. I don’t think I’ve enjoyed a weekend as much as I enjoyed this weekend in as long as I can think. I went into the weekend with incredibly low expectations – that I would sit in a room with complete strangers that I didn’t know, leave without having talked to anyone and be completely put off doing the award which isn’t particularly well documented. I left the weekend more excited than ever to complete my SOWA, having spent a weekend with some of the most incredible people. The Scout of the World Award is an international award for people of Network Scout (Rover) age. The award’s requirements vary country to country as it is left to national scout organisations to develop, as long as it maintains the essence of the award. The Scout Association requires that Network members first attend a 14 hour discovery weekend to learn about the award, the three themes of Development, Environment and Peace, and start to plan their 80-hour voluntary service project. Arriving on Friday evening gave us the time to get settled in our base for the weekend, The Bemrose Centre at Drum Hill Scout Campsite, to meet our fellow participants (without the horrible cheesy icebreakers you’d expect) and to learn a bit about the award. When I said the award was poorly documented, I quickly learnt why. The Scouts of the World Award is the UK’s only award that is entirely for Network members. In the past, it has been run and organised centrally, which combined with the previous requirements, meant that discovery weekends were particularly hard to participate in for the Network demographic. This lead to only 9 people receiving the award under the previous scheme. Noticing the big lack of awards being completed, the scheme has been rebooted. The award is now delivered by counties and the time requirements have been altered. SOWA is closely linked to the Sustainable Development Goals, built on the progress made by the Millenium Development Goals. 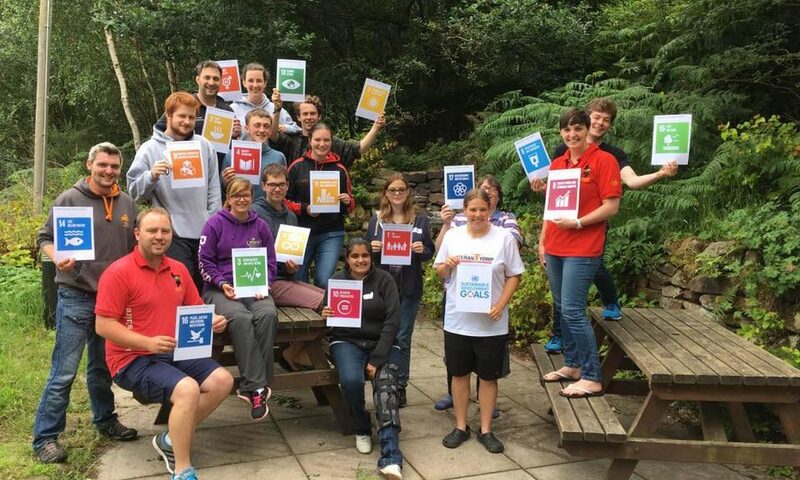 A large part of the weekend is devoted to learning about the SDGs, and discussing how people feel they interlink and their importance to different people. There are 17 SDGs ranging from environmental goals to justice and education. This is really where the fellow people on your course start to completely astound you. My fellow participants came from all around the country. We’ve all differing opinions and views, ranging from those who decided that for some reason they’d attend a Jeremy Corbyn rally, to a member of the Conservative Party. Yet, despite coming from different places, we all worked together under the idea that we wished to make a positive change in the world. Obviously, every diverse team has its problems. Over the weekend, fierce debates would be held over the differing definitions of North and South, and of course, what to call various bread-based items. Saturday evening was free time, and as all good Network members do, we found our way to the local pub for desserts and a drink or two. Following an uncharacteristically short trip, we returned to the site to sit around a fire and continue to share stories. Sunday was worrying, to begin with. After the briefing, you spend the weekend with the knowledge that after you leave on Sunday afternoon, you’ve got a project to go away, start and run. Going into Sunday, I had very few feasible ideas of a project I could do. I guess I spent the entire time focused on whether I could build a web product to contribute towards an SDG. I think I went into it with the right idea, but the wrong approach. My strongest skill set is in IT/ICT/Computing/whatever word you want to use to describe it. It wasn’t until we had some extended brainstorming time on Sunday while learning how to plan and manage a project that I managed to develop a small set of strong ideas by thinking about what I already did, and building off the foundations I had in Scouting. For those that don’t know me, I run ShoutWiki, a small wiki hosting business, I’m an Assistant Scout Leader and help out on a regular basis at the Scout Sailing Club. I left the weekend smiling. Confident in my project ideas, and have made some great new friends, I was a bit hesitant to leave. I didn’t want the weekend to finish but with the thought of waiting two hours for a 15-minute bus ride, I grabbed my bag and said my goodbyes. I’m not sure this post says much about SOWA, or my experiences, but the fact I’m sat here two days later, stilling smiling thinking about the weekend, probably says more than I was able to in this post. This post was inspired by the desire of The Scout Association that participants in this award share their experiences and projects to help raise awareness of the award and to encourage more people to do so. As someone who went in with virtually no idea of the award, I’m hoping that I can help out. I plan to post further, more comprehendible updates when I make more progress on this award.